The long-awaited project to rebuild the railroad track and then the pavement on Albany’s Water Avenue is under way. 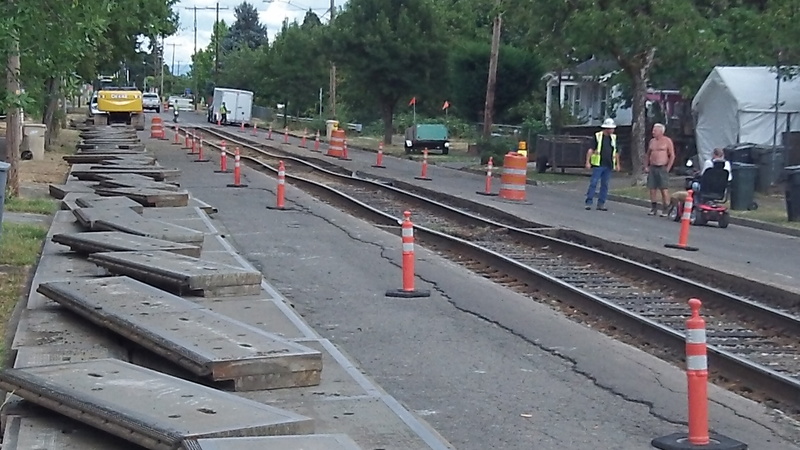 By Monday afternoon, crews working for the Portland & Western Railroad had lifted and moved to the side of the street dozens of concrete and steel plates that made up the driving surface on the track. The plan is to level out the track first. Then a contractor for the city will follow up by resurfacing the street and install curb ramps where necessary to make the intersections accessible to people in wheelchairs. On Aug. 14, the city council awarded a $168,976 paving contract to Knife River Corp. of Tangent to do four blocks of the street, from Main to Harrison Street, this year after the track work is done. The remaining three blocks from Harrison to Geary Street will be done next year. From David Moore, via Facebook: It looks like they are not digging down far enough again. So it will break up again in several years. Well, they are saving money in the short run.